MOSCOW, December 7. /TASS/. Russian President Vladimir Putin did not rule out that the countries of Southern Europe can be connected to the Turkish Stream pipeline through Greece. He made this statement at a press conference following talks with Greek Prime Minister Alexis Tsipras. "We are ready to implement, together with Greece, major infrastructure energy projects. This also applies to the possibility of connecting Southern Europe to the Turkish Stream through Greece," he said. The Russian leader added that Moscow is now discussing this issue with its Turkish partners, as well as with Greece. He recalled that a pipeline from Greece to Italy has actually been built, but it is yet to be filled with gas. "You can think together about how to fill this route with a real product. This is a matter that requires separate consideration, primarily in terms of economic feasibility for economic players, including Russian ones. But it is quite possible, I do not rule out this, moreover, we believe that this is quite realistic," he concluded. The Turkish Stream project envisages the construction of a gas pipeline across the Black Sea to the European part of Turkey and farther to the border with Greece. The seabed section is to be about 910 kilometers long and the land section will run 180 km into Turkey. Gas deliveries via the first stretch of the gas pipeline are designed to meet the requirements of the growing Turkish market, while the second stretch is planned to deliver gas to the countries of Southern and South-Eastern Europe. Each thread will have a capacity of 15.75 bln cubic meters of gas a year. The project is estimated at a total of 11.4 bln euro. 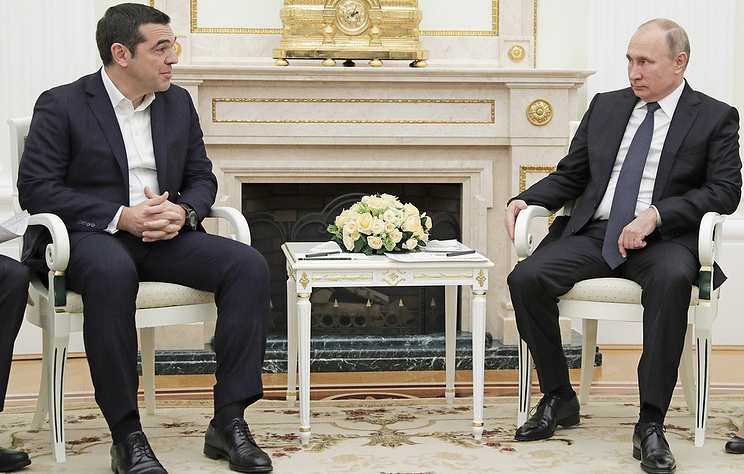 Vladimir Putin believes that as the Greek economy strengthens, Russian investment in the country will grow. "I am sure that if the situation in the economy stabilizes, then other participants in economic activity - and the investment potential of Russian business is very large - will be more active and confident," Putin said on Friday at a press conference following talks with Greek Prime Minister Alexis Tsipras. The Russian leader wished the Greek government to overcome all the difficulties in the country's economy as soon as possible.